Photo by Daryona. This file is licensed under the Creative Commons Attribution-Share Alike 3.0 Unported, 2.5 Generic, 2.0 Generic and 1.0 Generic license. The Northern Giraffe is an artiodactyl mammal that belongs to the Giraffidae family, which currently has modifications in its taxonomy considering it as a species that has three subspecies: the Nubian Giraffe (G.c. 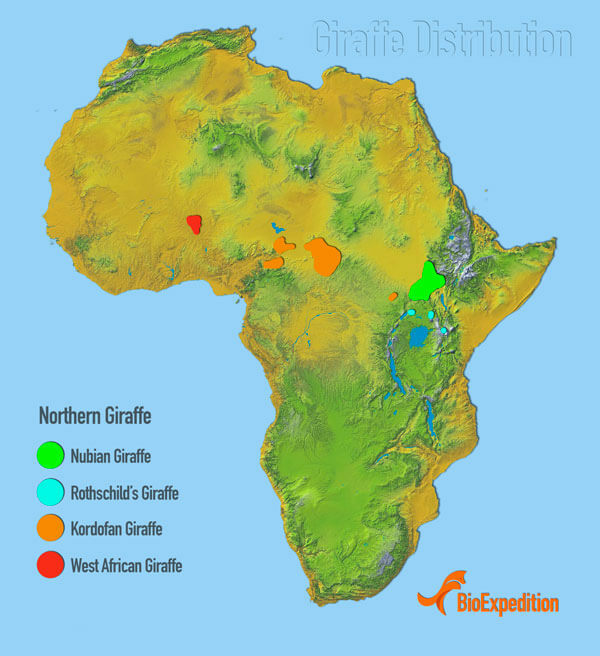 camelopardalis), the Kordofan Giraffe (G c. antiquorum) and the West African or Nigerian giraffe (G. c. peralta). 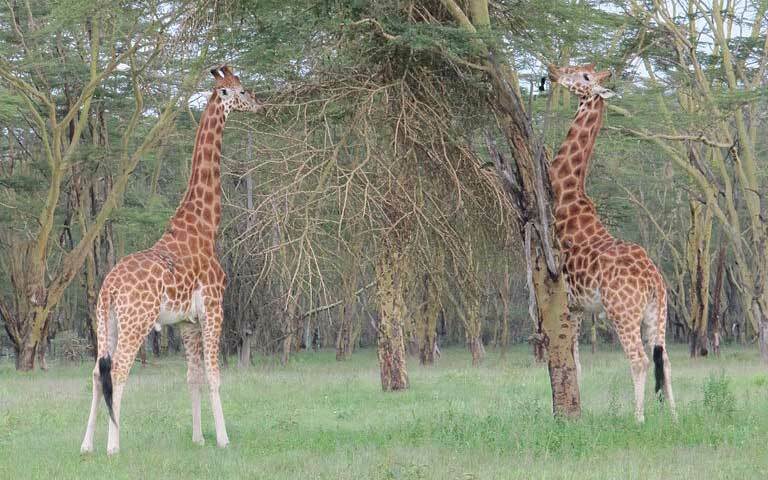 The males are taller than the females, but they are not bigger than the Masai giraffe, which is usually the tallest species. All giraffes have irregular brown spots, but the northern species has the paler ones, since their polygonal patches vary between orange, reddish brown or chocolate, but they do not have the color intensity of other types of giraffes. The legs spots fade being less intense at knee height, but below them, they are practically white. However the facial patches of this species cover more of the face than their southern relatives, so it could be a way to differentiate them. Another way of distinguishing those of the north with the ones of the south is by observing their ossicones, the ossified cartilage protuberances that giraffes have on their head that look like horns. The southern ones are smaller and shorter than those of the north, and the males of the northern species have a third ossicone measuring up to 5 inches in length. The savannas, bushes, and forests of Kenya and Southwest Ethiopia are natural habitats of the northern giraffe, but there are also populations in the Democratic Republic of the Congo and southern Sudan. 8% of the territory of Kenya is under protection with more than 50 parks and reserves. The Aberdare National Park in Kenya offers an excellent habitat to giraffes. The Dosso Reserve in Niger, is home to hundreds of Giraffa camelopardalis, although outside this sanctuary there is a significant number that is vulnerable to poachers. According to the latest census, there are multiple local extinctions in several places in Africa making the northern giraffe the species less populated and with a higher probability of becoming extinct. Besides having some of the smallest populations of all subspecies, two of the three subspecies have a decreasing tendency. The first settlements of northern giraffes that occurred during the Pliocene were in the territories that today include Chad and Algeria. Morocco, Libya, and Egypt were part of its territorial range until its extinction in that area around 600 A.D. when the hot and dry climate of the desert made the conditions impossible for them. This species is very rare in captivity, but there are some individuals in the Giza zoo, the largest in Egypt and Al-Ain in the United Arab Emirates in the Middle East. Giraffes are herbivorous, and the Northern species is no exception. Its natural environment provides different types of leaves, flowers, fruits and shoots of woody plants where the Acacia has a prominent percentage in its daily diet. In a single day, they can ingest up to 140 pounds of vegetation. Due to their ruminant nature, they have a complex digestive system divided into four chambers and strong muscles in the esophagus that allows it to regurgitate its food from the stomach to the mouth. Under stress, they may chew bark, and sometimes they lick dried corpses, probably to get calcium from the bones. During the rainy seasons, giraffes disperse over a wide territorial range, but in dry seasons they gather around perennial trees and shrubs, as well as around bodies of water where they also share space with other types of fauna. Larger males have the ability to mate with fertile females. For this, they evaluate the reproductive status of the latter through sniffing and testing their urine. Usually, the young adult cows attract the attention of the male partners, not the youngest nor the oldest. The courtship of a male to a female includes licking and physical contact with the head and ossicles. Northern giraffes feeding on trees Lake Nakuru National Park, Kenya. / Photo by Daryona. This file is licensed under the Creative Commons Attribution-Share Alike 3.0 Unported, 2.5 Generic, 2.0 Generic and 1.0 Generic license. Births occur in unity, and the mothers always stay standing while the offspring falls to the ground from a height of almost six feet. Within a few hours of being born, the calf instinctively stands with the mother’s help and begins to take its first steps. The short time to make this is imperative to avoid the arrival of predators. Perhaps 25 years of life expectancy is a low number for us, but considering that giraffes live in such difficult conditions where they are victims of diseases, both natural and anthropogenic threats and climatic phenomena, is a high number that not all animals can endure. Adult individuals are unlikely to be defeated by natural predators such as lions, leopards, hyenas and African wild dogs because of their size, their developed senses and the deadly defense they have in each of their kicks. However, sometimes they are defeated by the force of the crocodiles who take advantage of the unbalanced position they adopt when they are inclined to drink water. It is not the same for the young, easy victims of herds of carnivores that split into groups where a party chases the mother while the other kills the unprotected calf. Human armed conflicts or anthropogenic causes such as poaching and the reduction or modification of their habitat, or natural causes such as drought are very common problems in Africa. All giraffe species have a Vulnerable status according to the International Union for Conservation of Nature (IUCN), and the latest estimations showed a population of 3,050 Northern giraffes across the continent. Such population numbers revealed a considerable decrease in the population since the last evaluation which put this species on the brink of extinction, especially the West African subspecies. In countries such as Niger, several conservation projects focus primarily on educating the community about awareness of the respect of the natural diversity.